What is the Birth stone for February? Amethyst is the birthstone of Month February. Amethyst is a commonly seen semiprecious gemstone that has a unique violet color. It belongs to the quartz family and is traditionally the birthstone of people born in the month of February. Due to its legendary powers and striking beauty, Amethyst has always been considered to be a valued gemstone since the time of the Romans and Greeks. The color of Amethyst ranges from pinkish violet to dark purple. The structure of this gemstone is relatively hard making it apt for use in jewelry. 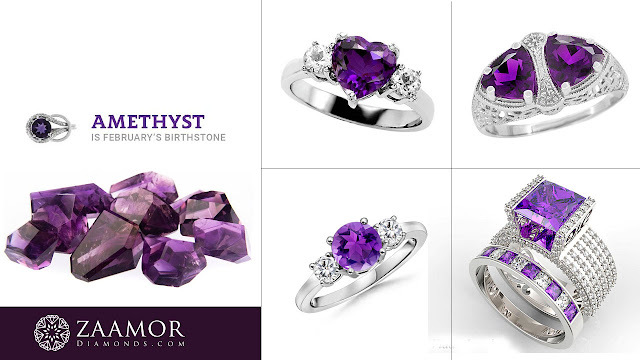 Some of the common varieties of Amethyst are Chevron Amethyst, Brandberg Amethyst, Rutilated Amethyst and Ametrine. People adhere to the use of amethyst for mental and physical peace. Amethyst is purple in color. Amethyst, the gemstone believed by ancient Greeks and Romans to ward off the intoxicating powers of Bacchus, also was said to keep the wearer clear-headed and quick-witted. Throughout history, the gemstone has been associated with many myths, legends, religions, and numerous cultures. Not only is it the beautiful color that makes this gem so popular but it is also widely available in difference shapes and sizes which makes it more affordable. Amethyst complements both warm and cool colors so it looks fabulous set in both yellow and white metals. This unique ability means it enhances almost every color in your wardrobe. Why Diamonds for Valentine’s Day proposals? Zaamor Diamonds Blog: What is the Birth stone for February?